If you operate a commercial truck in B.C., or if the new season of Ice Road Truckers has inspired you to research the business of big rigs, then let the Ministry of Transportation and Infrastructure be your first stop for B.C. commercial transportation information. Commercial trucks play a big role in moving goods across the province. 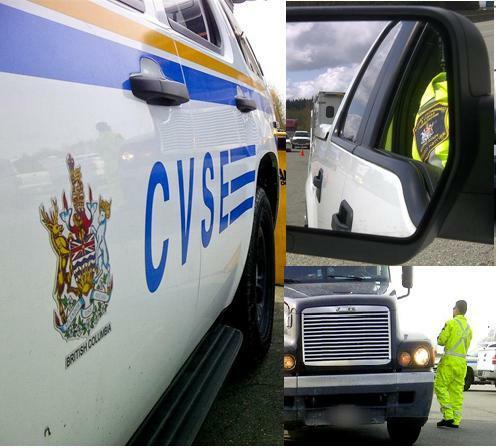 Our Commercial Vehicle Safety and Enforcement Branch (CVSE) makes sure commercial carriers follow safety regulations to help protect motorists and roadways. The CVSE branch is responsible for enforcing a wide variety of standards and regulations, making it a bit overwhelming to start cruising for information. That’s why we asked CVSE for their top five frequently asked questions. 1) What class driver’s licence do I need? Class 1: Semi-trailer trucks and all other motor vehicles or combinations of vehicles except motorcycle fall into this category. To learn how to drive a big rig, ICBC provides a list of steps on how you can get a commercial driver’s licence. 2) When towing a trailer is it necessary to have more than a class 5 driver’s licence? 3) Do I have to report to scales if I’m bobtailing? Why? (Bobtailing is term used when a commercial truck is driving WITHOUT a trailer attached). All commercial vehicles with a licensed Gross Vehicle Weight (GVW) exceeding 5,500 kg are required to report to scales (aka inspection stations), including those being used for bobtailing. Vehicles are checked at the scales for safety items which remain important regardless of whether the vehicle is being used temporarily for personal use. 4) What is a Box 2 Notice and Order? A Notice and Order is an enforcement tool requiring certain actions to be taken. Police officers and peace officers may issue a Notice and Order. A Box 2 Notice and Order requires a vehicle to be repaired and presented promptly to a Designated Inspection Facility for an inspection. An Authorized Inspector at a Designated Inspection Facility will conduct the vehicle inspection and complete an inspection report. A passed inspection report must be provided to the Commercial Vehicle Safety and Enforcement Branch within 30 days. The consequence of not complying with the order is that the vehicle will not be allowed to operate on a highway, nor will the vehicle be permitted to renew its licence and insurance. It is also an offence to operate a vehicle if the Notice and Order has not been complied with. 5) A police officer or peace officer gave me a Notice and Order; where can I take my vehicle for an inspection? A Notice and Order issued against a vehicle by a police officer or a peace officer requires that the vehicle be repaired and presented to a Designated Inspection Facility for inspection. Locations of all Designated Inspection Facilities can be accessed at an ICBC Driver Services Centre, Autoplan Agent or via this PDF. Alternatively, you may contact any Commercial Vehicle Safety and Enforcement Branch office for the information. If this list has piqued your interest, click here for answers to other important questions and you’ll be well on your way to learning about what it takes to be a top notch trucker in B.C. If I am pulling a personal use skid steer in a trailer where the combined weight would be 5100KG am I required to report to a Weigh Scale. All personal use no commercial. I was asked to drive a Dodge Ram 5500 deck truck from Kelowna to Langley for the purpose of my job. The vehicle has a GVW of 13,550kg. Am I required to stop at the scales along the way? Also am i required to have a log book? I only have a class 5 license, am I even allowed to drive this vehicle at all? The CVSE has responded directly to your email with more information on this question, but we are posting their response here as well, in case anyone else has a similar inquiry. Thank you for your question, it sounds like you would have to stop at the scales especially if you have a licensed GVW over 5,500kg. You would also have to contact ICBC to make sure you personally are licensed to drive a truck that size. If you have further general questions it is always a good idea to contact any of our http://www.th.gov.bc.ca/cvse/inspection_stations.htm throughout the province. why would you have only punjabi translations ????? are these people exempt from the knowledge of the English language, do they have special privileges in Canada…if so WHY ???? For class 5-8 knowledge tests, ICBC offers the test in several different languages: English, French, Arabic, Chinese, Croatian, Farsi, Punjabi, Russian, Spanish, and Vietnamese. For all commercial knowledge tests, it must be conducted in English. For all road tests, the test itself is conducted in English only. If there are language issues, a friend, relative, or translator may assist in the road test preamble and the road test results debrief. If you have any other questions about driver licensing, please feel free to call ICBC Customer Contact at 1-800-950-1498.